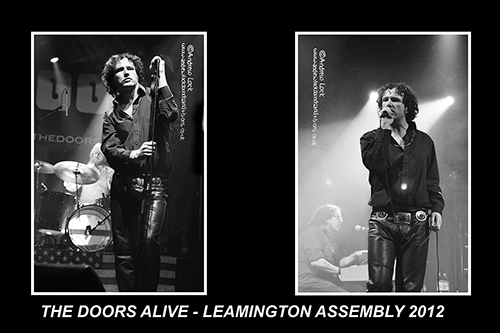 One of the finest tribute bands I have ever seen in action, this band amazed me upstairs at The Assembly back in 2012 by capturing both that wonderful Doors sound and giving the audience a total recreation of what it must have been like to have seen Jim Morrison and crew on stage in the sixties. The bands Jim has the voice, the look/style and also the at times the outrageous showmanship of the Lizard King, everything that is required for a totally convincing portrayal of one of the most iconic frontmen of all time. The other 3 members of the band (no bass player of course but I am always thrilled being an Elvis fan that the kings bass player Jerry Scheff was in the studio playing on the final Doors album and masterpiece that is L.A Woman) bring all the musical attributes of Ray, Robby and John to the table. At that Assembly show back in 2012 I was also impressed with the stage lighting that gave the show the look and feel of seeing the band in action in an L.A. bar as they strutted their way through the likes of ‘ When The Music’s Over’, ‘Break On Through (To The Other Side)’ and ‘Light My Fire’. Of course it should also be the chance to hear tracks from that final Doors album that because of tragic events were rarely if at all performed live by the band with Morrison at the helm such as ‘L.A. Woman’ and ‘Riders On The Storm’. For me this is one of the towns shows of the year and if they are as good as back in 2012, Friday 1st December at The Zephyr Lounge will be a night not to be missed.